I’ve known Andrew McGregor for a few years, and in that time have found him to be a silly, serious and interesting fellow. 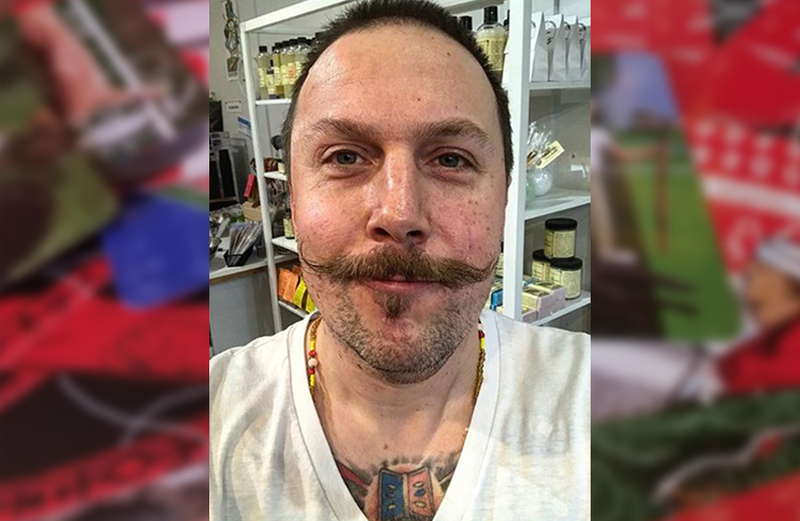 He owns the Hermit’s Lamp in Toronto, and has recently released the Orisha Tarot and answered a few questions for us about his work, his faith and his new deck. Why did the Orisha tarot come about? Like most people we work to understand something new in relationship to a system we already know. So I started looking at the correlations and overlap between the two systems of divination. How do they look at the same kind of situation in different ways? Where do they share a point of view? 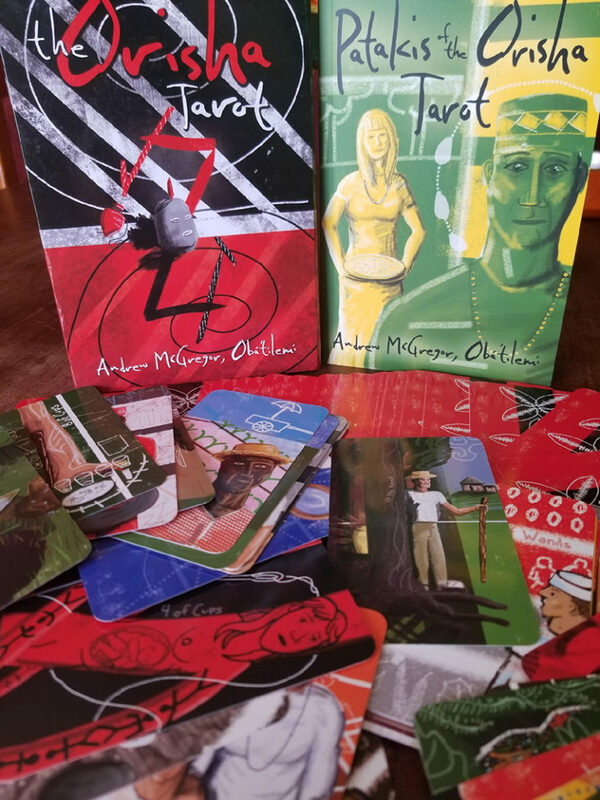 In looking around at the other decks already in print I did not find anything that related to traditional approaches to the orisha traditions. Many of them had no relationship with tradition at all as far as I could see. So I started talking with my elders about it. I asked Ellegua if he wanted me to make this deck too. With both their support started creating the deck and applying to Llewelyn to get the project rolling. How did you come to Orisha as a practice? TBH, like two people have asked me why a white Canadian dude has an Orisha deck. I understand their curiosity here. I know right? A Torontonian doesn’t seem like a probable candidate for this deck or even to get involved in the Lukumi tradition. In the late 90’s I was involved in a small group of ceremonial magicians who met regularly to both practice ceremonies and to stretch each others world views. One of these people became interested in Afro-caribbean spirits and the group started to explore working with them. Though I had no interest previously I felt a tremendous draw to these spirits and a more religious and devotional way of working. So I did what most folks do in the beginning – I lit candles and started altars. Over a very short period of time it became obvious to me that whatever was happening I needed the guidance of an elder. So I started to look around for traditional practitioners. At this time it was hard to connect with others around this kind thing. The internet wasn’t what it is today and the few people I did find in forums seemed sketchy to me. Eventually I found someone local connected to an Ile (house) in Detroit. I went down to meet them and saw felt a connection with the spirits and the people. I got a reading from my first Godfather and confirmed that it was a path I was welcomed into. Over time I received smaller initiations before becoming crowned (initiated) to Shango in 2008. Since making Ocha I’ve spent the last 10 years studying with elders, travelling when time allows and serving the Orisha. Is there a card that you most identify with? I don’t identify with one in any ongoing way. It changes with what is going in my life. Right now I feel like the High Priestess. Having completed the deck I feel like the oracle itself. Sitting between the world and the world of spirits. In between tradition and the modern world. So much of my work on this deck, my personal religious life, reading cards for people, working magic, and guiding people comes from this space of being in-between. In the deck this High Priestess shows the cowry shell oracle. They are the living mouth of the Orisha and guide much what happens the religion itself. The straw mat on which they are shown resting fades out to show the stars and infinite cosmos moving to guide the oracle. That is often how I feel. Connected to this world on one level and connected to everything on another. How do you hope that people will use this deck? I hope that people will use this deck to read about everything. This deck is not intended only for people with a history in the tradition. It is a way for people to explore the stories myths and wisdom of the Orisha traditions. This wisdom applies to everyone. What is something you wish someone would ask you about this creation of yours? I think there are folks who are worried about being seen to be appropriating the tradition by working with the deck. From my point of view appropriation consists of pretending to be something you are not. That is in this case saying that you are initiated if you aren’t. Or that the spirits are speaking to you through the cards when from a traditional point of view they only speak through traditional oracles. Working with the deck and respecting these two points means you are not appropriating tradition but respecting it. Also think some folks are worried they’ll get pulled into the tradition by working with the deck. However, the reality is the spirits themselves don’t speak through tarot. Working with this deck is more like reading and sharing anthropological stories. It isn’t an invocation of those spirits but a sharing of knowledge and ideas. If it does happen to be a part of your Ori (destiny) to work with the Orisha you’ll find yourself drawn to it over time.